The final is all set for the 2019 Australian Open and it’s set to be another cracker. The recent Slam finals on paper have all been very exciting and this one, featuring Petra Kvitova and Naomi Osaka, is right up there. More on Saturday’s final in this post (spoiler alert – i’m torn) and highlights from a swelteringly hot semi-finals day in Melbourne. Petra Kvitova is into her third Slam final and first away from Wimbledon after a straight sets win over Danielle Collins. The roof came into play at 4-4 in the first set due to the soaring temperature. Like previous rounds, Collins adapted beautifully to the situation and was certainly not overawed early on. Kvitova made quite a few unforced errors and really struggled on return, but managed to recover an early break to stay in touch. From the first set tiebreak onwards, Kvitova began to improve. A sumptious crosscourt backhand at 1-1 in the TB signaled the start of her surge. Collins had a few disagreements with the umpire (beep gate 🤣) and was unable to fend off a free-flowing Kvitova in the second set who was especially lethal on the backhand side and imperious again on serve. I’m so thrilled to see Petra back in a Slam final, particularly after what was a disappointing season at the Majors in 2018. The first set was a struggle but I think it was meaningful that she managed to stay in it and then raise her level. There’s no doubt that the introduction of the roof was favourable for the Petra. Kvitova discussed her journey back from the attack and her friendship with Li Na who is rumoured to be doing the trophy presentation for the women’s singles final. In a high quality match, Naomi Osaka made it back-to-back Slam finals with a three set win over Karolina Pliskova. Osaka was an absolute winner machine, hitting 56 winners to only 30 unforced errors. Osaka really went after her shots and went to town on the Pliskova second serve, not something you see very often. I thought Pliskova did remarkably well to stay in contention in the second and she eventually took advantage of a lapse final service game from the Japanese player to force a third set. Osaka saved four break points in the decider and they were all fantastic clutch saves – forehand winner, backhand winner down-the-line, backhand forcing an error and an ace. The last break point save was at *4-3 *40-Adv in the decider where Osaka had been struggling for a few points to find a first serve. On the break point she found it. It’s become rather customary of late for Osaka to be able to raise her game for the big points and she is fast developing into one of, if not the toughest match player on tour. I always thought she win would more Majors after the US Open but I wondered if 2019 might be more a transitional year… nope! I’ve been blown away by this start to the season. Naomi said she was scared serving second serves 😂. Further adding to the fascination of this final is that they’ve never played each other before and the winner will be the new number one! With no data points for their H2H and both playing so well for this tournament, I don’t think there is a clear favourite at all. Kvitova has yet to drop a set all tournament and has an amazing record in finals, winning 24 of 31 WTA level finals and her last eight. She’s also a perfect 2 for 2 in Slam finals at Wimbledon. Osaka has had the tougher route through the draw but I don’t see that as a negative. In fact, i’d probably say it’s a positive because it has forced her to problem solve and she has come through with flying colours on each occasion. I’m probably 51-49 in favour of Kvitova because she’s normally pretty locked into tournaments by the end. She didn’t start that strongly against Collins in the semi-finals but I thought the way she ended the match was noteworthy. At the same time, there is something special about Osaka. The way she played in her first Slam final and has been consistently finding her best tennis in the key moments during this Australian Open just makes me think she is going to bring her A-game for the final. I think they are both awesome and I will be thrilled with either winner. I’m team Petra for this final because I think it would be such an incredible moment after everything she’s been through. I’m expecting that this poll will be close to 50-50!!! 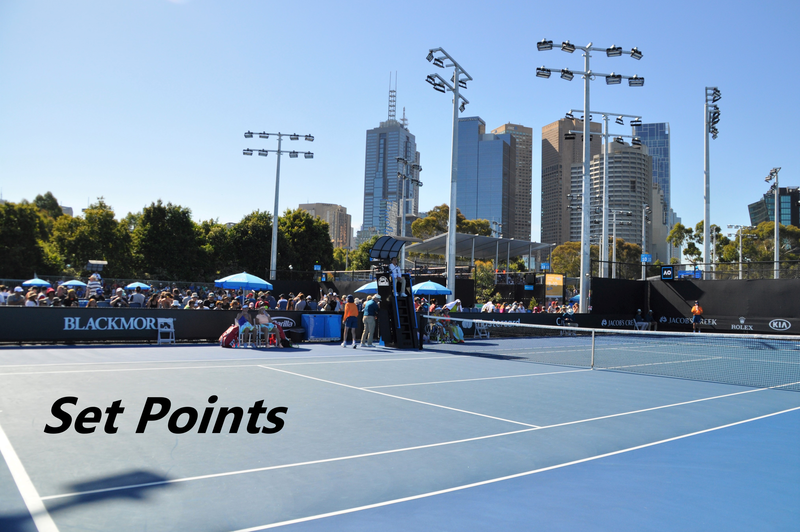 January 24, 2019 in Australian Open, Set Points, WTA. I want Petra and Novak as winners (like 2011 & 2014 Wimbledon). My heart says Petra, my head says Naomi if she plays the way she did in the final set of her match against Karolina – as a BBC commentator said after that match, it was like watching Serena again. 🙂 loved it! The sheer fact that she could have won in straights, but went to a third and the match quality from both women remained high, just encouraging. That much belief from both players is great. Commiserations to Kvitova, she played great, but Osaka was the slightly more aggressive one. Within a year, she’s gone from top 100 to no.1. I think the work done on her mentally, by Sascha, should not be discounted. No doubt when on form, you catch glimpses of a ‘Serena’ in her play, that is her inspiration. ..lol I can live with myself when Serena retires, Naomi, hopefully, will keep that power baseline tennis burning hot.